MORE FORENSIC FILES! – CLICK HERE! *Video is necessary for completion of this worksheet. As of March 2016, the entire episode is available free on You Tube which could make it ideal for computer lab or homework assignments (technology access provided). 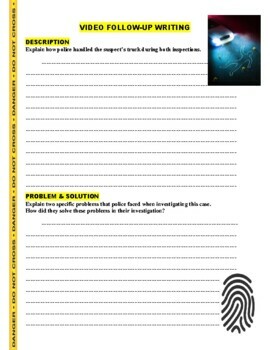 A 14-question worksheet to accompany this video documenting how police and forensic scientists in Minnesota used DNA evidence to catch a killer after the only eye witnesses to the crime disappeared. Questions on the assignment go in order and will help students remain focused on key science topics. Two extended response questions are on the back of the worksheet (description and problem/solution) which are perfect for reflection and discussion at the conclusion of the video. The worksheet is given as a MS-Word document which will allow easy modifying to fit your class. *Besides You Tube, the video needed for viewing can be purchased through a variety of sellers both as physical media or through streaming viewing (including Amazon, Netflix, and Hulu - availability does change). Thank you for your purchase and for taking the time to leave me positive feedback.